“District News and Announcements” is a monthly e-newsletter for members and friends of the Church of the Brethren in the Northern Plains District. District Leaders, Commissions, Committees, and those doing special ministries share information on programs and activities. Local churches share news and invitations. Send submissions by November 24th for inclusion in next month’s newsletter to Hannah Button-Harrison, Director of Communications, communications@nplains.org. Banner photo: Bill & Lois Grove provided altar decoration for World Communion Sunday at Peace COB from their collection of material and utensils from their time as missionaries in Nigeria. Photo taken by Laura Leighton-Harris. Send in your photos for future newsletters! Email communications@nplains.org. What is a hidden gift you would like to develop? STORY CIRCLE PROMPT: Name a gift you would like to develop with the help of those around you. Dream on paper about a gift that is not yet visible to those around you. Create a plan. Picture a community around you, helping you achieve it. How are you feeling at each step along the way? Ask each person to answer the Story Circle Prompt. 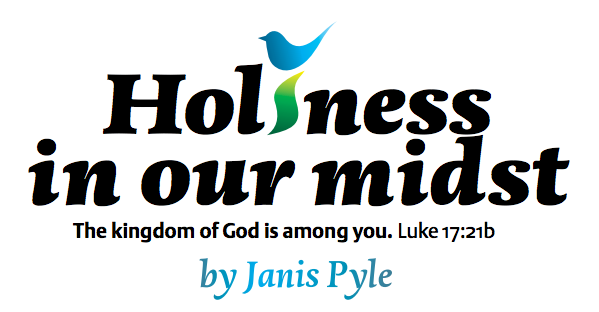 Note: Holiness in Our Midst: Sharing Our Stories to Encourage and Heal is a monthly on-line feature created by Janis Pyle to facilitate sharing of our personal experiences, thoughts, beliefs, and spiritual practices with one another, especially through stories. Barriers are broken down when we begin to see all persons, even those with whom we disagree ideologically, as sacred and constantly attended to by a loving Creator. Each column is accompanied by a “story circle” prompt and study guides for personal and group reflection. To share your stories, contact Hannah Button-Harrison at communications@nplains.org. Janis Pyle can be reached at janispyle@yahoo.com. “District News and Announcements” is a monthly e-newsletter for members and friends of the Church of the Brethren in the Northern Plains District. District Leaders, Commissions, Committees, and those doing special ministries share information on programs and activities. Local churches share news and invitations. Send submissions by October 25th for inclusion in next month’s newsletter to Hannah Button-Harrison, Director of Communications, communications@nplains.org. Banner photo: Barbara Wise Lewczak speaks during Beaver Church of the Brethren’s closing service. Photo by Rhonda Bingman. Send in your photos for future newsletters! Email communications@nplains.org. For having a sense of humor, lightness and goodwill. For showing up each day, wherever in the world I was, building community with kindness. STORY CIRCLE PROMPT: How would you like to be remembered? For the world, 07.19.2018 @ 4:38 in the afternoon is just a date and time on a calendar. But for a specific group of people, in Marshalltown, Iowa, it is not just numerals, but they are characters that remind us of a specific moment that altered the course of our hometown. This date will be branded in our memories. The EF3 tornado that rampaged through our community changed the landscape of our hearts and souls. This transformation is visible in the city’s infrastructure to the deep-rooted trees that no longer provide shade and shelter to the traumatized mental and emotional lives. Yet, in the aftermath of this disaster, our comm“unity” compelled by an innate desire to “love thy neighbor as yourself” chose to act. Neighbor helping neighbor; churches united; businesses halted to take care of others; compassion for each other was felt and experienced. 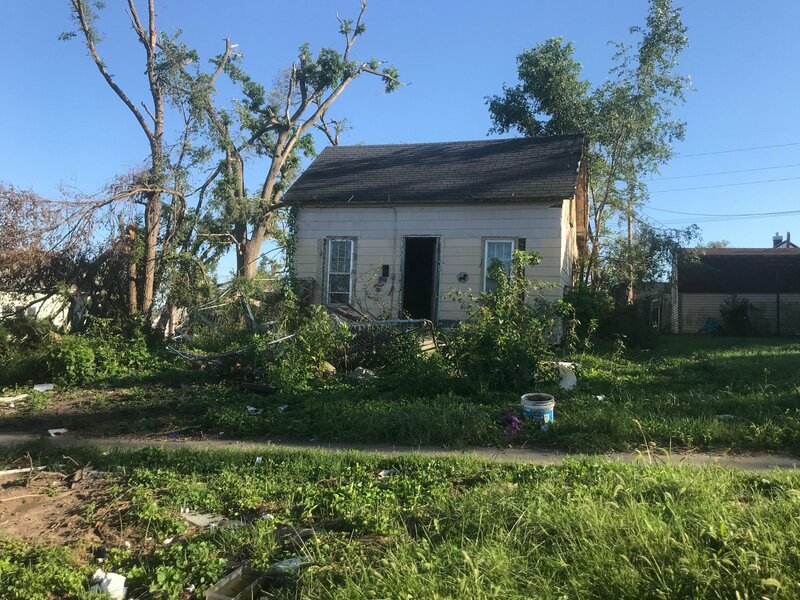 One month post-tornado, our initial crisis relief efforts are mostly complete. 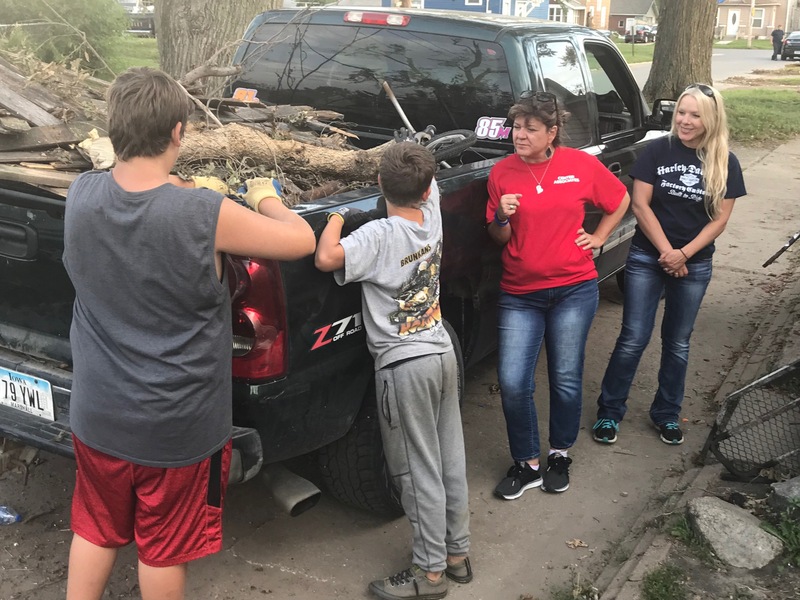 Many individuals jumped in working collaboratively with all those impacted by the disaster. Government, churches, and non-profit agencies, local, state, and national, have put “boots on the ground.” They came, they saw, they helped, some left, others stayed and some will come back again. We were “all hands on deck” post-disaster. We did well and we continue to persevere in our longing to help each other. 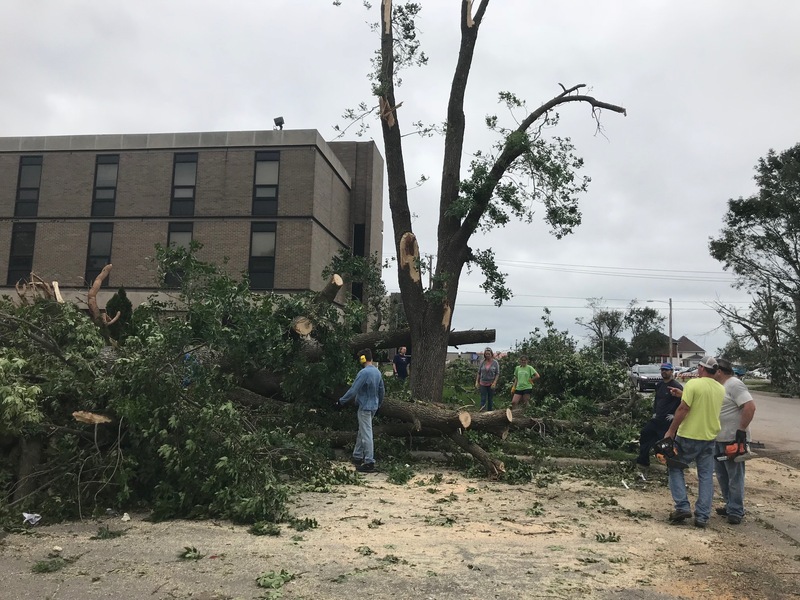 Iowa River Church of the Brethren has been blessed to receive support throughout this disaster. Although not directly impacted, we had families from our congregation who experienced loss. Yet, the church surrounded not only them, but took on the idea of becoming the Matthew 25 church helping where it was needed. Immediately following the crisis, church banded together to provide basic needs (food, water, shelter); church was opened up for volunteers to use while helping the impacted; church provided meals for volunteers and the law enforcement agency; prayer walks in the community were part of our “boots on the ground;” ministry of presence to those families was done; food coupons and cards were passed out to families. Iowa River COB was truly alive and doing ministry. The fervent prayers of the faithful received to date are unmatched and we continue to welcome your prayers to sustain us during this time of crisis. The donations received from individuals in the area, various Brethren Churches, the Northern Plains District, and Brethren Disaster Ministry has overwhelmed us to propel us to ministry and become the hands and feet of Jesus. There is no greater joy we find as we become messengers of the Good News of Jesus Christ. 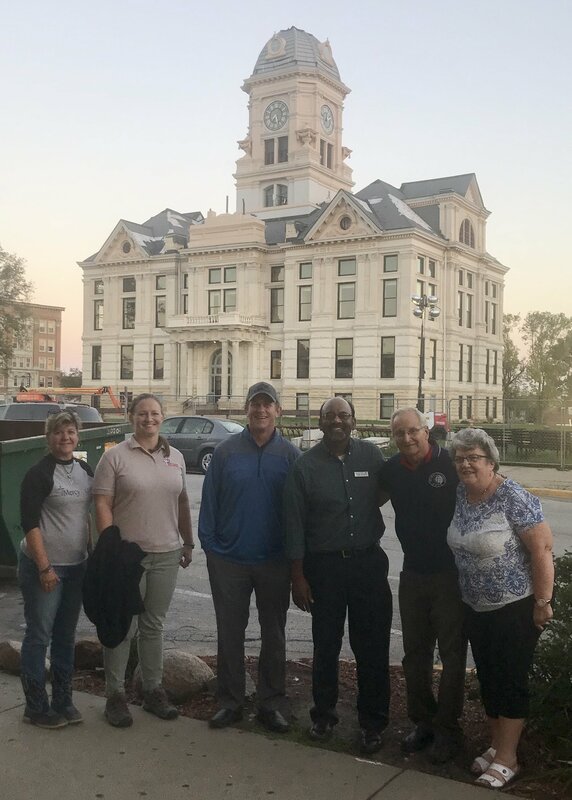 On August 29 2018, our NP Disaster Coordinator and the Brethren Disaster Ministries Director toured the city and received a report on the impact that Iowa River COB is having in the community. Leadership of the church are involved in the rebuilding process through long-term recovery and Chaplaincy with the Marshalltown Police. 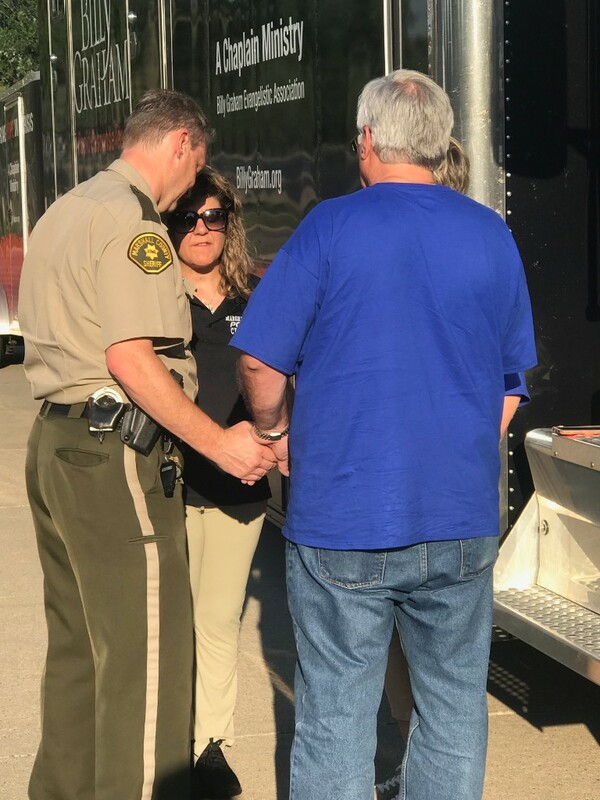 During Thanksgiving week 2018, working with the Marshalltown Police and Sheriff, Iowa River COB will do ride-a-longs with law enforcement passing out “Thanks-living” Cards for basic food and needs. In December, we plan to initiate the Kingdom Assignment of giving each church family $100 to “Pay it Forward” as they deem necessary in the community. Our church is on the move, a church without walls. As a community, we are moving into the long term healing process. We have provided and/or made available immediate response and relief for all those impacted. Now, we move onto the next level of rebuilding. This is a long process yet our resiliency is strong. With God as our guide, we will rise again. We will not be defeated. We will rebuild. We will be restored. We are MarshalltownStrong but most importantly, we are GodStrong. “District News and Announcements” is a monthly e-newsletter for members and friends of the Church of the Brethren in the Northern Plains District. District Leaders, Commissions, Committees, and those doing special ministries share information on programs and activities. Local churches share news and invitations. Send submissions by September 24th for inclusion in next month’s newsletter to Hannah Button-Harrison, Director of Communications, communications@nplains.org. Banner photo: Northern Plains youth doing a service project at Habitat for Humanity ReStore during District Coference. Photo by Jeff Finke, ReStore Manager for Iowa Heartland Habitat for Humanity. Send in your photos for future newsletters! Email communications@nplains.org. Why are we born? Why has God put us here? In a classic episode of the sitcom “Everybody Loves Raymond,” daughter Ally, age 8, asks these questions. Her mother Debra had just assigned her father Raymond to give Ally the “facts of life” talk. Ally wasn’t interested in the “birds and bees” details, which he had prepared extensively to give her. Instead, she wanted answers to these deeper questions of life (which baffled Raymond and the whole Barone family, who deferred them, in an emergency call, to the family priest). What is your answer to these questions? As we listen to each other’s answers, we gain insights into what motivates and shapes the perspectives of those with whom we agree and differ. My answer comes from the Westminster Shorter Catechism, which I had to study to join Highland Park Presbyterian Church in Des Moines, IA at age 11. The first question was: What is the chief end of man? The answer: Man’s Chief end is to glorify God, and to enjoy him forever. Having put aside the masculine language, I still retain the belief that I exist to glorify the Creator, but my primary goal has always been to enjoy the Creator. This carries with it the capacity for relationship. That means that the Holy One can enjoy me back! I also believe we are here to make our little corner of Earth more like Heaven, and, using our highest gifts, work toward the common good. How do you view Life’s purpose? STORY CIRCLE PROMPT: Why are we here? Reflect in your journal on the ultimate meaning of life. “District News and Announcements” is a monthly e-newsletter for members and friends of the Church of the Brethren in the Northern Plains District. District Leaders, Commissions, Committees, and those doing special ministries share information on programs and activities. Local churches share news and invitations. Send submissions by August 25th for inclusion in next month’s newsletter to Hannah Button-Harrison, Director of Communications, communications@nplains.org. Banner photo: Northern Plains youth and advisers pose in front of their bus on the way to National Youth Conference. Photo by Barbara Wise Lewczak. Send in your photos for future newsletters! Email communications@nplains.org. Share how a teacher influenced your life. I was only in the company of the teacher who most influenced my life for 15 minutes. Her name was Mrs. Talbot, and she taught in the combined third and fourth grade classroom at the K-12 Fernald (IA) Consolidated School in the mid-Fifties. I was a second grader, being escorted to her classroom to determine if I read well enough to advance a grade. I whizzed through the pages in an advanced reader. After all, I had read 80 books in a reading contest (and won!) in the first part of my school year. Mrs. Talbot suddenly asked me to stop reading, closed the book, and said these life-altering words: “Young Lady, don’t you ever, ever read ahead!” “Okay,” I said. The following month, I moved away, so I never learned her verdict on skipping a grade. Nor did I ever understand the reason for the words. I only knew that they were said with a frowny face and enough gravity and force that they stuck with me. To this day, I don’t read tomorrow’s daily devotionals today. In retrospect, this teacher’s influence proved to be both detrimental and helpful. On the negative side, I never worked on or anticipated future assignments throughout my schooling, I was a good but not outstanding student. After college, I didn’t spend enough time looking out for my personal future. On the positive side, as a writer type, I owe Mrs. Talbot a debt of gratitude. In following her warning, I have stayed rooted to the day at hand, immersing myself in the lives of people along my path, in rural Iowa or far-away mission sites, and recording their everyday stories in magazines and newspapers. My religion involves seeing God in the ordinary and encouraging others to do the same. My writings are a record of the sweet, quirky meandering journey, even as I continue to spend more time looking around at today’s scenery than mapping the road ahead. STORY CIRCLE PROMPT: How was your life changed by a teacher? Remember on paper an influential teacher and his/her life lessons. “District News and Announcements” is a monthly e-newsletter for members and friends of the Church of the Brethren in the Northern Plains District. District Leaders, Commissions, Committees, and those doing special ministries share information on programs and activities. Local churches share news and invitations. Send submissions by July 25th for inclusion in next month’s newsletter to Hannah Button-Harrison, Director of Communications, communications@nplains.org. Banner photo: A photo of the Beaver church building, taken during the cleanup day on June 16th. Photo by Rhonda Bingman. Send in your photos for future newsletters! Email communications@nplains.org.